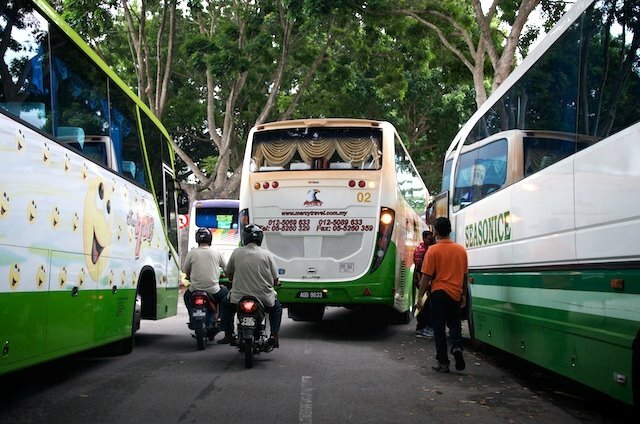 Buses park anywhere they want on KL roads. I was lucky to be the first car behind them and not one of the many in line behind me. I would've been so frustrated waiting for them to move. Hey Hey It's Saturday. I've have a great day and hope you have too. Heading home tomorrow. Friday afternoon prayers. Very important to the Muslim community. Assalam'mualaikum. Down. That's where I'm going. Down to Singapore to pick up my suitcase of clothes. 30kgs worth of clean undies and my favourite t-shirts. I'll be posting everyday. No worries about that. I'm there for a few days only. To say hello to friends and work out details for my postponed show. I was sitting in my car, traffic as usual, twiddling my thumbs with the music loud. Wasn't going anywhere. There was a flyover support pillar next to me. These signs just hung there. 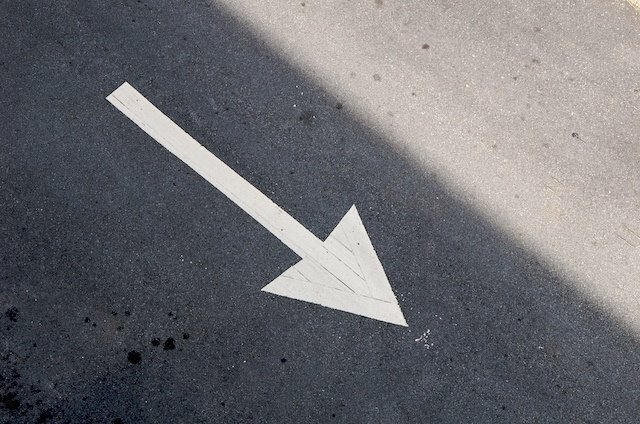 One was an arrow to a wedding, the other was looking for people wanting to earn from home. I wondered why anyone would put signs in such a place when I realized it was for us drivers who were stuck in traffic with nothing to read. 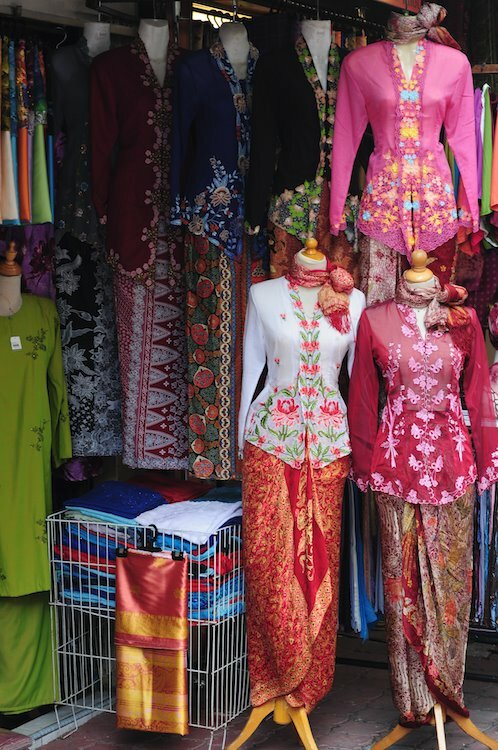 Here's a store that sells ready-made baju kebaya, a body-fitting outfit. The blouse is coupled with a batik sarong. In the days of yore, women had these tailormade to fit their body shape. The most soughtafter kebayas are the ones made by the Peranakan people. The delicate lace and intricate embroidery second to none. But for most women looking for a quick fix, these ones in the picture will do. Guess what folks? I'm back in KL. My show in Singapore which was supposed to be in August, has been moved to March '09. I won't disclose the reasons until the company does. We were going to begin rehearsals today. I was really looking forward to it. So, after turning down several corporate assignments, I'm going to be using these next 2 months to wrangle myself a little sumthin' sumthin' to keep myself occupied. I was feeling a little flustered, like having to change car tyres in the dark of night, but I found my Maglight and I'm ready to go. KLDP is back! Thank heavens for photography. Up and down. 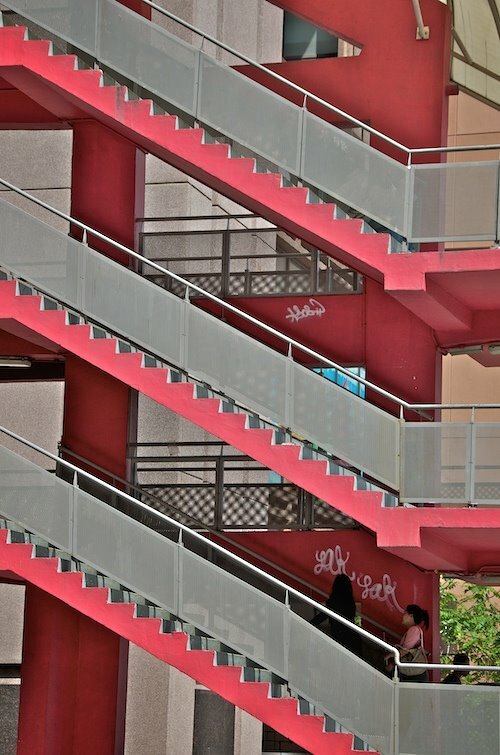 A staircase somewhere in KL. Looked good. Snapped a shot. Here it is. Okay folks, I've left it quite late to announce it but here it is. In 2 days, I'm off to Johor Bahru to spend a couple of days with a local charity, Care United. I'm there to help raise funds for their children/old folks programmes. Then when I'm done, I head straight down to Singapore where I begin rehearsals for a musical. I'm there for 2 months. The show Superhero Diaries, goes on at the end of August and will be in the Singapore Indoor Stadium. This show will see 2 of my childhood dreams come true. First, I get to share the stage with one-time popstar Debbie Gibson. I loved her songs when I was a wee tween. She plays a villain and I play one of the heroes that has to defeat her. Second, I get to perform in a stadium in front of thousands. Thousands! But here is my promise to you. I won't disappear completely. I will take as many shots of KL as I can, save them in my vault and post at least once a week, with updates to my life in the island nation. 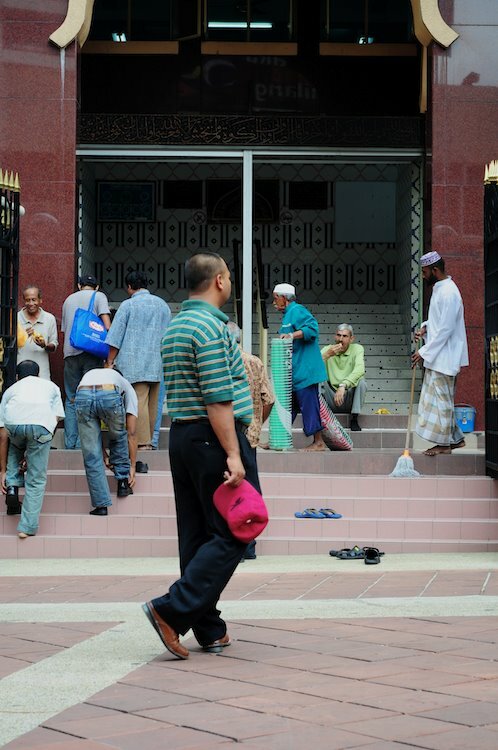 Driving through one of KL's many narrow back lanes, a short-cut to avoid Sunday shoppers traffic and guess what? Traffic in the lane too! 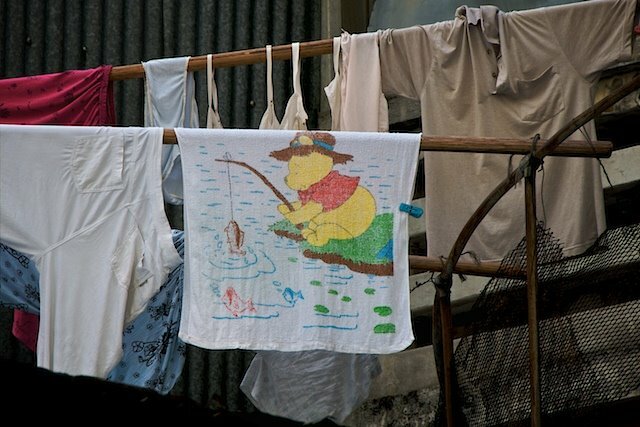 But saw this Pooh bear towel drying on the line. What a Sunday! Okay, though George Benson sang it first, it was Whitney Houston who took it worldwide and told us she believed children are our future, teach them well and let them them lead the way. Yeah, after the last 2 years of teaching, I believe it too. Look at this little girl, chewing on the national flag. If she is taught well, she'll be one of the many that will stand tall and wave the flag. I'm feeling extremely positive today. After a roundaround hunt, I finally got my hands on an Epson R1900. That also means I MUST NOT spend anymore this whole month. The pictures coming out of it are amazing! 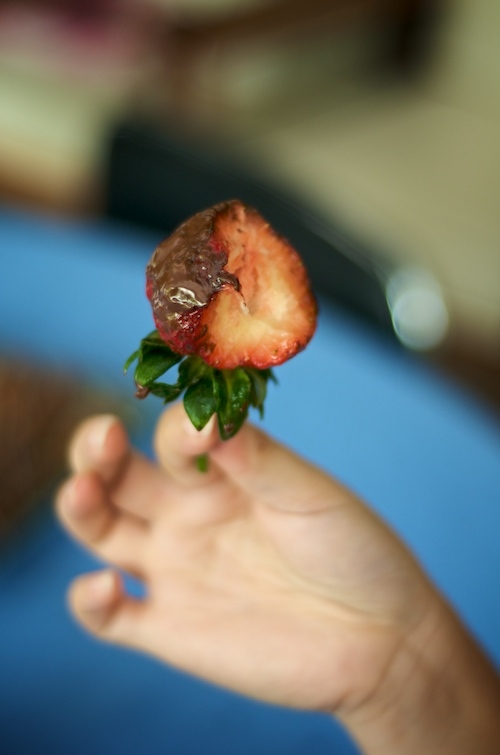 You know a party is a success when the host serves big, juicy strawberries and a pot of warm, thick chocolate for dessert. It was a birthday party for a 3 year-old. I was so absorbed in taking pictures, I only had 1 of these yummy berries. It's Friday and time for another wicked weekend. Enjoy my lovelies. At midnight, petrol and diesel prices went up by 40%. 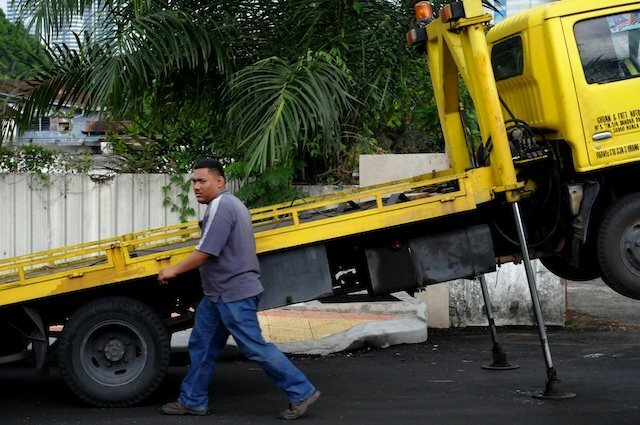 This was due to the government's measures to combat climbing fuel prices worldwide and as part of a move to restructure the country's subsidy package. The Prime Minister said the fuel prices would be reviewed every month in line with world oil prices. 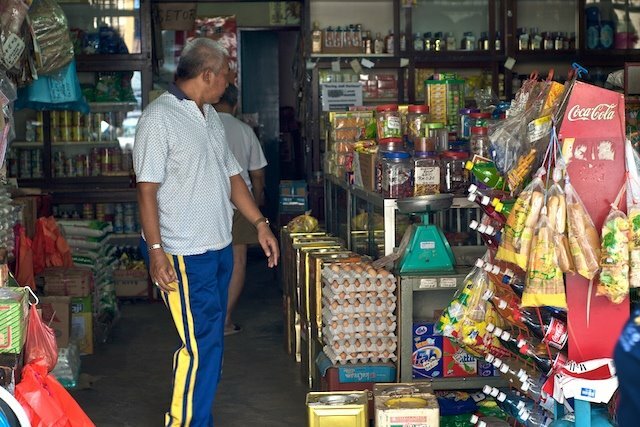 This revamp would save RM13.7bil, a large part of which will be given back to the people through rebates and other subsidies. 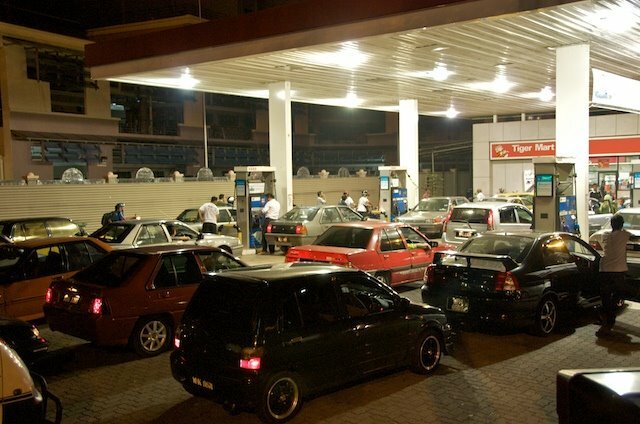 Despite these reassurances, hoards of drivers caused traffic at all petrol stations last night. 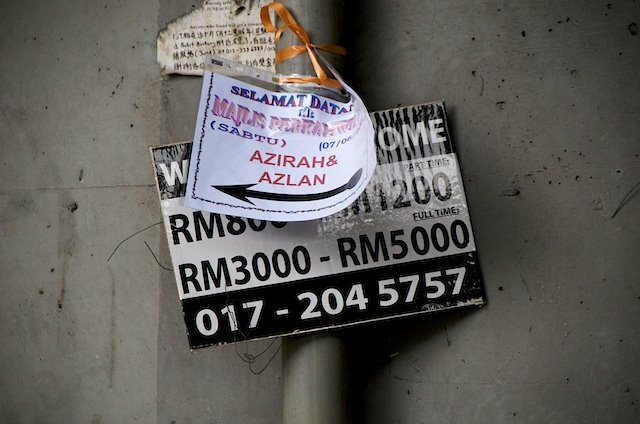 The petrol price increased from RM1.92 to RM2.70 per litre. A .78sen hike. That's a lot. Thus the insanity at the stations. I wanted to join them and fill my tank but realized this wouldn't change matters. I would eventually have to fill my car when the tank was empty and pay the new rates. So, I got on my bicycle, camera in my backpack and made my way to the nearest station. Luckily I did that. The traffic began a mile away. Snapped this shot and watched as the petrol drained away. By midnight, the station tanks were empty. I spent most of yesterday in a recording studio helping one of my favourite local charities, Care United, put together its club song. 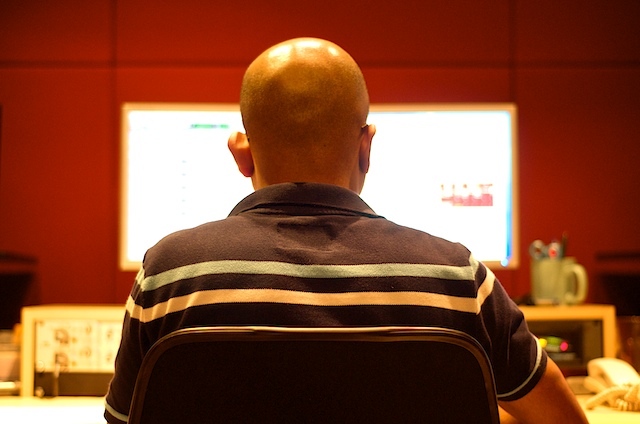 This is the back of sound engineer Mohan while his was twiddling the knobs at the soundboard. His colleague Jon had earlier recorded the minus-one. It was a fun day and we all went to a fabulous Korean BBQ dinner when we were finished. Thank You Care United and keep up the brilliant work. Those of you who know how much work I do with children and how I love snapping candid shots of them in motion will know how happy I am getting this shot after weeks of posting buildings and things. I was just taking a walk to get some perspective. Then I found myself in a low-cost government-sponsored housing area just 10 minutes from where I live (I had walked an hour by then.) 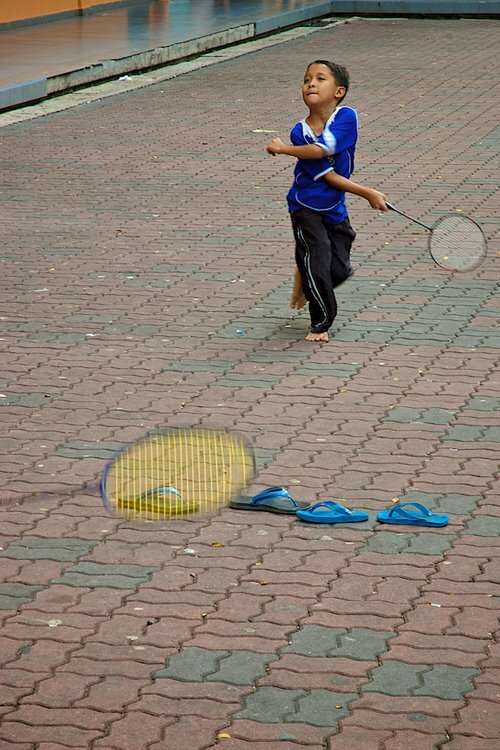 Saw these kids playing badminton using their slippers as a marker for a net. They asked me if I wanted to play. And I did, for 10 minutes and walked home happy. Got a shot and some exercise. Who wouldn't be happy, eh? 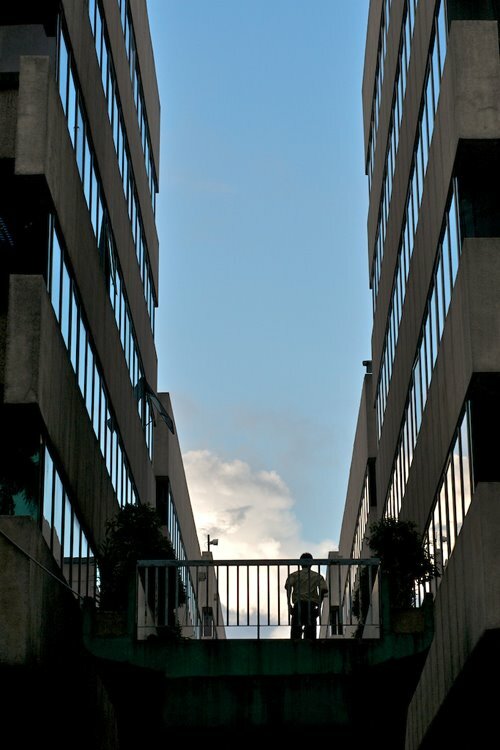 I was walking around the business district and was overwhelmed by the tall buildings standing tall over me. I need to see the sky. I get a little fidgety in cramped spaces. Then just when I thought I was about to explode, this gap in the concrete greeted me. And look, there's a man over there looking at the sky too. June. A popular month for weddings in the Western Hallmark world. But today is the first day of June and it's theme day for the Daily Photo members. This is Woh Sing, the corner sundry mom'n'pop store on the main street where I live. For as long as I've lived here (30+ years), Woh Sing has provided us with our everyday needs. Though I go to the markets and supermarkets, I still pop in to pick up a thing or 2. Like yesterday for example, I went to get garbage bags and flour. Now you've seen my little corner shop, go visit the other ones around the world.